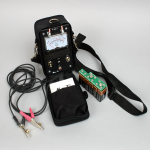 The 811-DS-5 Data Safe Test Set is a weatherized test set designed for rugged outside use. 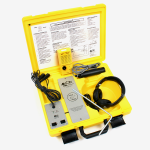 The high impact of the 811-DS-5 Data Safe Test Set ABS housing and rubber mat keypad enclose a moisture resistant coated circuit board able to withstand severe weather conditions. 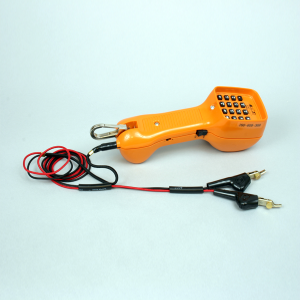 The sturdy MT-811 has a high-visibility orange housing, oversized belt clip, and weatherized cord set with offset piercing clips. 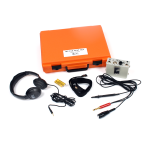 For extra convenience the MT-811 also offers 9 speed dialing numbers of 18 digits (including the * and #) with storable pauses and last number redial, in tone or pulse. Two A76 1.5 volt batteries protect the memory. The speed dialing features are easy to use and the recessed keypad prevents accidental loss of programmed numbers in memory. The combination of durability, functions and ease of use make the MT-811 an outstanding test set value. The MT-811 meets and in some cases exceeds Bell Communications Research Technical Reference TR-TSY-000344.